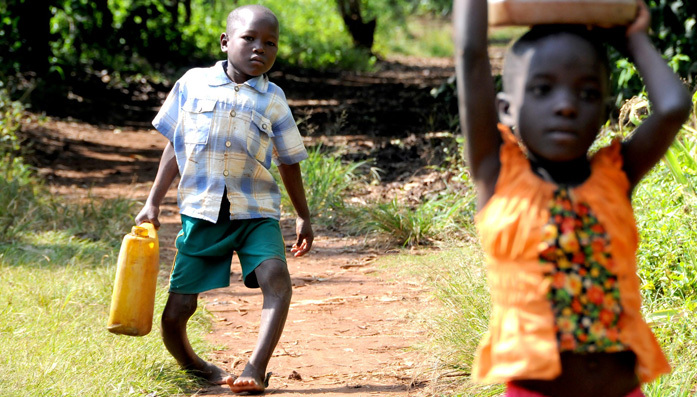 8 year old Denis lives in a village 90km northeast of Kampala, the capital of Uganda. He lives with his half-sister Roy, her husband Ronald and their three children. They are a truly loving family. However it wasn't always like this for Denis. Denis was born with Blount’s Disease, which causes his legs to bow, making walking slow and painful. Like many children with disabilities in poor communities, his childhood has been scarred by neglect and abuse. Denis' birth mother abandoned him, leaving him with his father who mistreated him. "He didn't bring Denis to a doctor or send him to school. Instead, he gave him abusive names because of his disability. He has even beaten the boy", explains Roy. Roy and Ronald brought Denis to live with them a year ago and care for him as their own child. But life is not easy; they live in a small mud hut with no electricity. Water comes from a nearby well or water hole. The household income from growing sweet potatoes, maize and beans and from Ronald's small business making bricks, barely covers the essentials and the children's school expenses. Denis' condition, Blount's disease, made it hard for him to join in games with other children. He struggled to help with family chores like sweeping or collecting water. The walk to school would take him over an hour as he had to stop to rest several times because of the pain. Roy worried about Denis' future and tried to save money for him to see a doctor, but it was too expensive. “If he remains with this condition he will face very difficult times in future. Hhe may never be independent. He may need help at all times. He will have a lot of pain and his mobility will always be limited" she explains. In late 2014, Roy and Denis received a visit from Agnes, an outreach worker from our partner hospital. As part of the hospital’s Community-Based Rehabilitation (CBR) work, their workers go out to villages to identify people with disabilities and offer them the support they need. Agnes arranged for Denis to be assessed by orthopaedic surgeon and CBM co-worker Dr Anthony Loro. He diagnosed Blount’s Disease and explained that Denis would lose the ability to walk altogether without treatment. Agnes explained the treatment to the family; it would not be an easy process, but in a few months Denis’ legs could be straightened. Thanks to CBM supporters, the treatment would be free and she would support the family throughout the process. Denis’ treatment journey began with surgery to straighten his right leg, the most severely affected, and attach metal plates to his left leg. After the surgery, an “external fixator” or metal brace was attached to his right leg. Physiotherapy started the next day. It was painful at times, but within a week Denis was walking on crutches. Roy was taught how to help Denis with his physiotherapy exercises, which were often painful but essential for him to recover, and how to keep the wound clean. After 55 days of rehabilitation, the fixator was finally removed. Denis´right leg had been completely corrected. 3 months after surgery, Denis started back at his local school on the first day of the new term. Agnes and other staff in our partner are working with teachers to help support Denis and other children with disabilities more effectively, and educate others in the community. Denis is now able to walk without crutches. For the first time, he took part in a running competition with his school friends. After a difficult start in life, he now has the chance of a brighter future; thanks to the help of CBM donors, the commitment of hospital staff, the love and support of Roy and Ronald and, of course, this remarkable little boy’s own courage and determination. “When he goes to school now, he doesn't come home complaining about pain in his legs”, explains Roy. “He doesn't need to rest on the way anymore, he can walk straight there now and back home. And nobody is laughing about him anymore. Back then, I even considered taking him out of school, because the way to school was so long and hard for him, and he would come back home in pain. So I thought maybe it's best to stop school. But today I´m so grateful about his rehabilitation and development. He is not left behind by other children anymore”.